One of the tools the Corps of Engineers is using to restore habitat along the Missouri lost during channelization is to create chutes and islands on public land adjacent to the river. 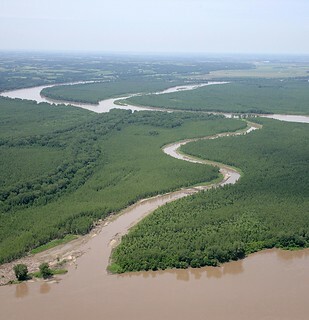 For some time, this was halted in the state of Missouri by a Clean Water Commission order stopping the excavation of the Jameson Chute on Jameson Island Unit of the Big Muddy National Fish & Wildlife Refuge, claiming that the dumping of alluvial sediment in the river during chute construction is a form of pollution. Brook Spear, a lawyer with the Great Rivers Environmental Law Center, gave an overview of Missouri River restoration, how it affects different Congressional authorized purposes on the river and why the stalemate over how to handle sediment on the Missouri River impacts future restoration. She discussed how different interpretations of the Clean Water Act apply to the use of sediment in restoration activities on the Missouri River vs. smaller clearwater streams. A special thank you to Greg Poleski of Greenway Network for making this happen in St. Charles! Before the presentation, folks had and opportunity to hop on the Big Junebug canoe with Mike Clark from Big Muddy Adventures for a short paddle through downtown St. Charles.